You mean I can only park where it's yellow, red, and blue? An outrage! 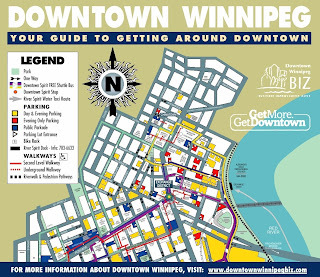 Graham at Progressive Winnipeg has a great article today about downtown parking; mainly, people who think that the solution to revitalizing downtown Winnipeg lies with knocking down every building possible and putting up another place to park our vehicles. As he rightly points out: it's a myth. "Parkades are symbolic. They are symblolic because they represent something that will never change as long as we keep building parkades: the habit of Winnipeggers to park, go to their destination, return to their car, and leave. To continue building parkades is to continue to say "we don't want our downtown to be our destination, we want our parking spot to be." Graham's article comes in response to the recent news that City Council wouldn't grant heritage status to the Grain Exchange Annex building on Lombard, which means the owner will likely destroy it to make room for yet even more parking. The decision still has to be affirmed by the executive policy committee on July 22. Graham also points out that the Downtown Winnipeg Biz is holding an info session tomorrow at the Globe Theatre from noon to 1:30 called, "The role of parking as a catalyst for downtown development." Even the title shows a strange positive bias toward having more parking, which is very odd position for the Downtown Biz to have, considering that it says on its website that "the Biz advocates for downtown revitalization and enhanced services on behalf of our members." While more parking may, in fact, be "enhanced services on behalf of its members," more parking has nothing to do with "revitalization." As someone who works downtown, shops downtown, works out downtown, and sees concerts downtown - all the time - I've never had one problem finding parking. Our parkades always have spots, there are tons of parking meters and free parking spots around Red River College (where I work), and the "traffic problem" that we were told we'd get before MTS Centre opened downtown never happened. In fact, it's about a million times easier getting around downtown after a concert than it ever was getting out of Polo Park. Anyone who thinks there's no parking in downtown Winnipeg never goes there, doesn't know what a parking spot looks like, is unwilling to pay as little as 25 cents at a meter (or to walk a block), or has never visited another major urban centre: in Chicago, I recently paid $200 U.S. for three days' of parking. No joke. That's because there really isn't any parking in downtown Chicago. In New York, one of my favorite pastimes is taking pictures of the daily, weekly, and monthly parking rates. The New York Times reports that parking spots are going for $50,000 (Brooklyn) to $225,000 (Manhattan). Winnipeg parking, compared to any similar-sized city in Canada or the U.S. is a bargain, because there's lots and lots of it. If you disagree, perhaps your best bet is to move to Regina, population 200,000, where big box stores, parking lots, and traffic rule. Or you could just wait around Winnipeg for another 10 years to watch Winnipeg turn into the same thing. *Update: no offense to Regina. I could've said Red Deer or any number of Canadian cities; but I know from stand-up that the word "Regina" makes all Winnipeggers sit up and take notice. Even the ones who are originally from Saskatchewan. I managed to go to school for two years downtown and almost never paid for parking. That would have been impossible in any other city. Even now, when I do drive to work, I still manage to get a free parking space. It's a ten minute walk from work, but I don't mind that so much. What really bugs me Kenton is that they've now installed parking meters along Elgin avenue, near the college, which has been free "2 hour parking" for a long time now. It's as though they just realized how in demand that space is, and decided to charge for it. Don't get me wrong, I understand the need to pay for parking, but this seems to me to be almost as bad of a cash grab as photo radar. If you don't like the parking situation in downtown, you could always take the bus. Oh, so the parking situation isn't that bad then? Fantastic!